Leeds Rhinos began the defence of their Super League title with a narrow defeat by Warrington Wolves at Headingley. 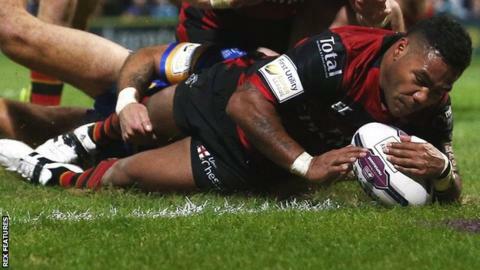 The hosts, who won the treble in 2015, could not initially break through a resolute Warrington, who led 6-0 at half-time with Chris Sandow's try. Brad Singleton and Ryan Hall crossed to put Leeds in front after half-time. Kevin Penny's converted score gave Warrington a two-point lead and Zak Hardaker failed with a 30-metre penalty which would have earned Leeds a draw. In their first competitive match since the departures of veteran trio Kevin Sinfield, Jamie Peacock and Kylie Leuluai, Leeds lost captain Danny McGuire to injury just before half-time. Youngster Jordan Lilley stepped into a half-back position to good effect, producing the pass that sent Hall over, giving the home side a 10-6 advantage. But at no time was Sinfield's absence felt more than four minutes from time, when last year's Man of Steel Hardaker was unable to land a kick that would have ensured a share of the spoils in the season's opening match. Warrington finished sixth at the end of a disappointing 2015 campaign, but the performances of half-back pairing Sandow and new recruit Kurt Gidley - as well as their powerful forward pack - pointed to encouraging times ahead for Tony Smith's side. "Leeds were hindered a little with the loss of McGuire, but no excuses. Warrington found enough quality in their attack and we saw some sublime touches from Sandow. "Leeds were dead and buried at one point, so the win comes down to how well Warrington defended, especially in the scramble moments when Leeds thought they were getting over the line." Leeds coach Brian McDermott: "It was a tough game to start with. "There were three or four things that we wanted to be good at and we were so there were more positives than negatives. "Both teams defended well, but we probably lacked a bit of fluency and cohesion when we attacked their try-line." Warrington coach Tony Smith: "Our defence was outstanding and it needed to be because we got tested. "They threw a lot at us and dominated in terms of field position and ball. They ended up with about 60 more plays than us, so that's 10 extra sets we had to defend. "There will be some weary and tired boys tonight, but the win was well deserved in terms of effort and reward. There were some fantastic parts of our play, most of it defensive." Leeds Rhinos: Hardaker; Briscoe, Watkins, Moon, Hall; Sutcliffe, McGuire; Galloway, Burrow, Cuthbertson, Ferres, Ablett, Delaney. Replacements: Singleton, Garbutt, Keinhorst, Lilley. Warrington Wolves: Russell; Lineham, Evans, Currie, Penny; Gidley, Sandow; Hill, Clark, Sims, Hughes, Westwood, Westerman. Replacements: Dwyer, King, Jullien, Cox. Have you added the new Top Story alerts in the BBC Sport app? Simply head to the menu in the app - and don't forget you can also add score alerts for the Six Nations, rugby league, your football team and more. Can anyone stop the Rhinos in 2016? Read more on Super League: Can anyone stop Leeds Rhinos in 2016?